We’ve all done it, cut up a credit card, frozen it in a block of ice, or locked it away, vowing to never use it again after falling into an uncomfortable amount of debt. But before you ditch your credit card, think of all the implications of doing so. You may think that the solution to your problems is cutting up your credit card(s) and closing the account. While it may resolve your spending habits, at least in the short term, closing your credit card account will lower your available credit, and push your credit score down. It all has to do with credit utilization, which is the ratio of credit used versus that which is available. By closing your account, you’re eliminating a credit line that was once available to you. Instead of canceling a credit card, consider storing the credit card in a safe place. If you don’t carry your credit card with you on a daily basis, chances are you won’t use it as often, even if you cheat every now and again. Tip: Keep your available credit even while closing a card! If you’ve got a credit card with a balance, often the result of a balance transfer, make sure you pay it on time and keep an eye on it to ensure you don’t miss payments or lose your introductory low APR. If your unused credit cards have no balance, consider using them for a recurring monthly item such as your cell phone or a utility bill. This way you’ll keep the lines of credit active, which can raise your credit score. Remember, more available credit equals a higher credit score. Tip: Many mortgage lenders require at least 3 lines of credit that are active and open for at least two years. You never know when you might get in a financial rut or run into an emergency. It’s always good to have a backup source of credit or cash if you encounter a problem. 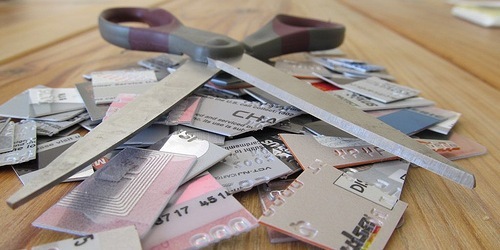 If you cut up your credit card(s), you’ll have fewer options to fall back on in the event of a crisis. Sure you can order a new credit card, but emergencies are typically unexpected and marked by urgency. Assuming you do decide to hold onto an unused credit card, put it in a safe place and periodically check on it to make sure no one has stolen it or made unauthorized purchases with it. Put it in a safe or a locker if you’ve got one. You may have executed a balance transfer and thought you’d never use the associated credit card. While this may be true, you may need to transfer the balance again after the introductory period expires, and if you don’t have all the credit card information, you may need to order a new credit card to get all that information. Believe it or not, credit card issuers aren’t big on telling you the credit card number, expiration date, and CVV2 number over the phone. So if you choose to cut up your credit card, jot down the card number, expiration date, and CVV2 number and put it in a safe place. (FYI, your computer is not a safe place and it’s good to keep all the info somewhat separate.) That way you’ll have the information if necessary, but you won’t have a physical card at your disposal. I’ve got a few credit cards I rarely use, but that doesn’t stop me from checking up on them frequently. As we all know, identity theft is rampant, and it seems to happen to everyone, no matter how careful we are. To avoid big problems, check your credit card accounts online periodically. Sure, you may not be using your credit card, but that doesn’t mean someone else isn’t. It’s probably best to understand that an open line of credit is a vulnerable one. If you don’t have online credit card management for all your cards, make sure you enroll today. Waiting a month until you get a paper statement could be too late. In conclusion, if you have too many credit cards and good credit, it’s fine to close a few accounts. Your credit score will likely dip in the short term, but as long as you have solid credit depth and limited debt you should be fine. Credit is a tricky thing, and unfortunately closing older accounts will do more harm than good, even if you don’t necessary need the line of credit anymore. If you do insist on closing a line of credit, do so at a time when you aren’t applying for credit, such as around the time you apply for an auto lease or a mortgage. It’s not worth the risk. Bonus tip: If you’re feeling creative, you can try turning your old and unused credit cards into forks and knives, or something else fun like a guitar pick or art project.